Now that we’re well into 2016, many of us are trying not to break our New Year’s resolutions. Some are trying to quit smoking, while others are making an oath to return to the gym. My personal resolution is something I’ve been trying to grasp for a while now: eating healthier. Since half of my job involves pizza I’ve got my work cut out for me, but after thinking about it I realized there are more than a few simple ways to make pizza healthier. One of these things is to swap your traditional dough recipe for a delicious antioxidant-rich whole wheat pizza dough. Our pizza cookbook, “Pizza: From Every Day to Gourmet”, features five great pizza dough recipes. One of these recipes is for a whole wheat crust, so we figured we’d share it just in case your New Year’s resolution is the same as mine. Dissolve yeast and sugar in a small bowl of tepid water; whisk gently to fully incorporate the yeast. Let stand 5 to 10 minutes while yeast softens and starts to form a creamy foam. Meanwhile, add the remaining ingredients to a large stand mixer bowl. Transfer dough to a lightly floured surface and knead by hand until dough is soft and elastic, approximately 5 to 8 minutes. Place dough in an oiled bowl, cover dough with plastic wrap and place a dish towel over the bowl. Allow dough to rise at room temperature for one hour or until dough doubles in size. Once the dough has doubled in size, turn it out onto a floured surface. 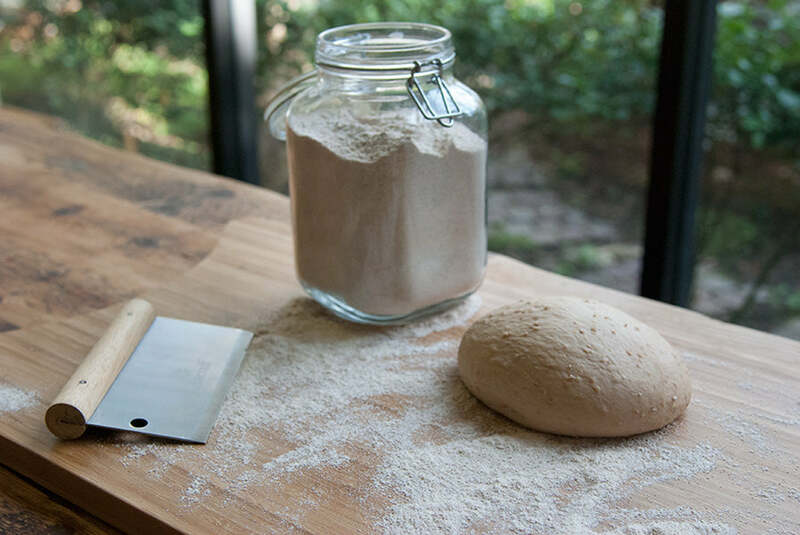 Use a knife or dough scraper to cut dough into four equal-sized pieces. Gently form each piece into a ball. Dust the dough balls with flour, cover with plastic wrap, and let the dough balls rise for 20 minutes. The dough is now ready for shaping. Follow the instructions in your recipe to finish the pizza. This recipe yields enough dough for four 10" pizzas. If desired, dough can be cut in half for two 16" pizzas or cut in thirds for three 12" pizzas. Whole wheat pizza crust is a tasty, wholesome, and healthy way to change up your pizza crust. Whether you’re trying to eat better or you’re just looking to shake things up a bit, I highly recommend giving whole wheat pizza crust a try. Tagged Pizza Crust, Whole Wheat. Most toppings will taste great with wheat dough. I asked our chef and he did mention that he likes a a rosemary, potato, chicken recipe on wheat. Red sauce, shredded mozzarella, pre-cooked chicken and fingerling potatoes (cut to 1/4 in thick rounds). Prepare the dough and add the cheese and cooled pre-cooked toppings. Bake on stone or in pizza oven at around 550 degrees. You can use the same whole wheat flour to help with transferring, or some cornmeal, but if you have it, all purpose flower has that super-fine texture that works so well on a peel. Do you recommend using Whole Wheat Flour when you roll out the dough on Pizzacraft Matt and placing on Pizza Peel? Is there any recipes for the wheat flour pizzas you recommend?